DC26 is an ultra-lightweight bagless canister vacuum for all floor types. 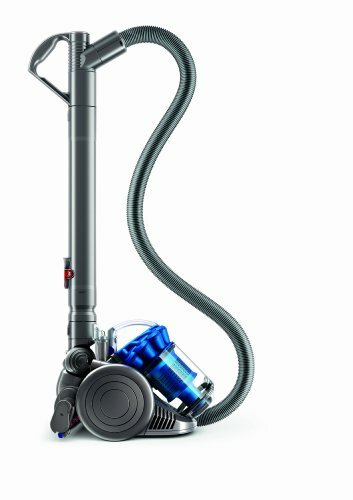 It’s Dyson’s smallest, lightest canister but works like a full-size Dyson machine, with no loss of suction. Each dimension and angle has been recalculated and engineered to make a smaller cyclone as efficient as a big Dyson cyclone. Small and compact, the base fits on a standard letter size sheet of paper – it’s easy to carry and store. The carbon fiber brush bar is ideal for cleaning short pile carpet, and can be turned off to protect delicate surfaces. The brush bar contains rows of ultra-fine carbon fiber filaments that reduce static and remove fine dust from hard floors. A lifetime washable HEPA filter traps microscopic allergens. DC26 Multi Floor also comes with an articulating hard floor tool that maneuvers easily and cleans narrow gaps. Root Cyclone Technology for No Loss of Suction Ordinary vacuum cleaners rely on bags to trap dust and dirt. As you use them, the tiny holes in the bag clog up with particles of dust. This restricts the flow of air, so the vacuum cleaner loses suction. Dyson vacuum cleaners don’t rely on bags to trap dust and dirt. They use patented Root Cyclone™ technology, which spins the air at incredibly high speeds. The cyclones inside a Dyson vacuum cleaner generate centrifugal forces many thousands of times the force of gravity. Dust, dirt and pet hair are flung out of the airflow and straight into the bin. No bag. No loss of suction. Concentrated Root Cyclone technology: Dyson cyclones capture microscopic particles down to 0.5 microns in size, with no loss of suction. No extra costs: Other vacuum cleaners are still designed to need replacement bags, belts and filters. 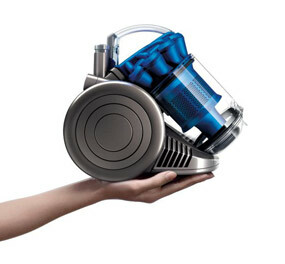 Dyson vacuum cleaners don’t need bags and have lifetime washable filters, so there are no extra costs to worry about. Turbine head with conductive carbon fiber brush bar: The brush bar contains both stiff nylon bristles for removing ground-in dirt from carpets, and ultra fine carbon fiber filaments, engineered to remove fine dust from hard floors. The brush bar is powered by an air driven turbine and is ideal for hard floors and short pile carpets. The floor tool clicks into the back of the machine when not in use for easy storage. Articulating hard floor tool: Maneuvers easily and cleans narrow gaps. Extra tools: DC26 Multi Floor also comes with a stair tool and combination brush/crevice tool. Clear bin and hygienic emptying: The bin on a Dyson vacuum cleaner is transparent so you can see when it needs emptying – and just how much dust, dirt and pet hair your new Dyson machine has picked up. It’s made of tough polycarbonate and can be emptied with the press of a button – minimizing the risk of contact with dirt. Miniaturized cable rewind: Smaller and lighter, without compromising cable length of 16ft. HEPA filter: Captures allergens, expels cleaner air. Traps microscopic particles down to 1/5,000 of a pinhead. Particles this small include common household allergens such as pollen, mould spores and dust mite feces. Centralized motor: Positioned to reduce drag weight. Makes the machine easier to pull along. Certified asthma and allergy friendly: DC26 Multi Floor is certified asthma and allergy friendly by the Asthma and Allergy Foundation of America. 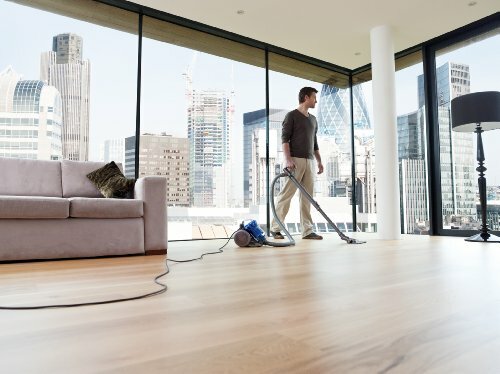 5 year parts and labor warranty: Your Dyson vacuum cleaner is likely to take a few knocks and bashes during everyday use – but that’s nothing compared to what Dyson puts its machines through during testing and development. All Dyson vacuum cleaners undergo a lengthy and rigorous testing program. That’s why DC26 Multi Floor comes with a free 5 year warranty – parts and labor. No bags or filters to buy. No extra costs. Other vacuums are designed to use consumables – so their manufacturers can make profits selling replacement bags and filters. 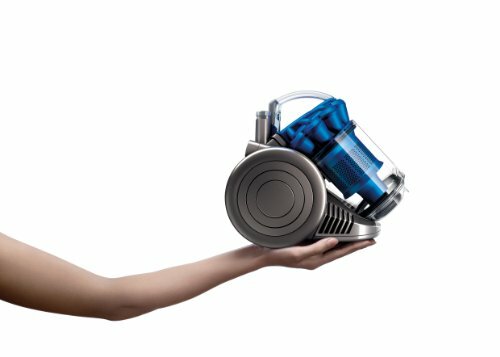 Dyson vacuums don’t use bags, and they have lifetime washable filters. There are no consumables – so there are no extra costs. Only Dyson-patented means Dyson performance Other products may look like Dyson machines, but they don’t work like them. Dyson technology is protected by more than 1,900 patents worldwide to ensure that when you buy a Dyson machine, you get what you expect. Efficiently engineered – less bulk, and less waste Dyson machines are tough. But they’re also efficiently engineered. Dyson is always looking for ways to use fewer materials, while at the same time making our machines stronger – doing more with less. 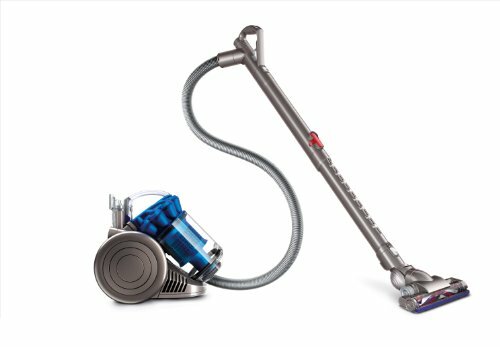 5 year warranty and a lifetime of support Dyson's canister vacuums are covered for 5 years parts and labor warranty. But we’ll still be here when yours runs out – we provide Dyson technology owners with a lifetime of support.